Official Mother’s Day Luncheon Details! The Associates for Breast and Prostate Cancer Studies (ABC’s) honored Sharon Stone with its Mother of the Year Award during its 16th Annual Mother’s Day luncheon hosted by ABC’s president Gloria E. Gebbia in Beverly Hills on May 10, 2017. Celebrity stylist Chaz Dean was presented with the Humanitarian Award. In addition to her philanthropic work, Gloria E. Gebbia is board director and majority shareholder of Siebert Financial Corp., Nasdaq: SIEB founded in 1967 by the late Muriel F. Siebert, the first woman to own a seat on the New York Stock Exchange and the first woman to head a NYSE member firm. Gloria E. Gebbia, along with the Gebbia family, has been involved with financial services companies since the early 1970’s and during such time they built a broker-dealer into a national brand, which they sold to Toronto Dominion Bank in 1997. 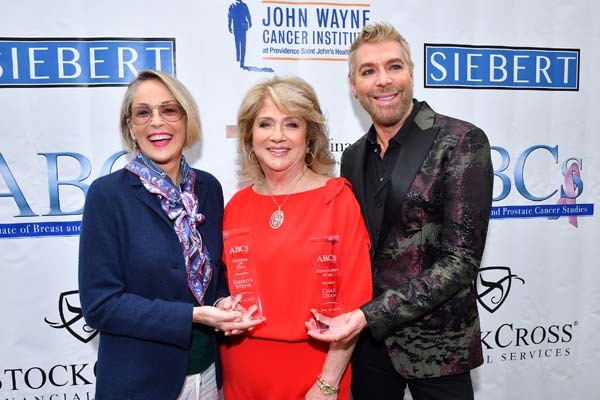 The ABC’s devotes all its resources through fundraising to eradicating breast and prostate cancer in support of key research studies at the John Wayne Cancer Institute (JWCI) at Saint John’s Health Center in Los Angeles, CA. Since its inception in 1990, the ABC’s has raised more than $16 million in support of JWCI. For example, according to the National Institute of Health (NIH), new research shows the number of women in the United States living with distant metastatic breast cancer, the most severe form of the disease, is growing. The study also shows that despite the poor prognosis of MBC, survival of women initially diagnosed with MBC has been increasing, especially among women diagnosed at younger ages. Sponsors for the luncheon held at the Four Seasons Beverly Hills included the John Wayne Cancer Institute, StockCross Financial Services, Siebert Financial Corp., Saint John’s Health Center, Total Financial, Four Seasons Hotels and Resorts, Arizona Premium Finance Company, Deitz International, Patterson Life and Sands & Associates. Previous ABC’s Mother’s Day honorees and supporters have included Gloria Allred, Lorraine Toussaint, Donna Mills, Brandi Glanville, Chandra Wilson, Holly Robinson Peete, Dolores Robinson, Amber Valletta, Kris Jenner, Guiliana Rancic, Jillian Reynolds, Ricardo Antonio Chavira, Lisa Rinna, Louis Gossett Jr., Nolan Miller, Cocoa Brown and Lisa Ann Walter. Since 1981, the John Wayne name has been committed by the Wayne Family to leading-edge cancer research and education in memory of their late father, legendary actor John Wayne. Today, the tradition of excellence continues as JWCI spearheads new research advances while training the next generation of surgical oncologists. The Institute conducts multidisciplinary basic, clinical and translational research on many complex cancer problems, focusing in particular on melanoma, breast cancer, prostate cancer, colon cancer, neuroendocrine cancer, gastro-intestinal cancer and sarcoma. Gloria E. Gebbia and the ABC’s are slated to host the 28th Annual Talk of The Town Gala in Los Angeles on November 18, 2017, also in support of the work of the JWCI. “We are very excited about our next Talk of the Town gala, as we have special guests and surprises lined up for a fabulous evening in support of this most important work,” she added.